My attempt at the Classic Bloody Mary. One of my favorite drinks is the Classic Bloody Mary. It's not breakfast or brunch without one! But the great thing about a Bloody Mary is that you can have them at any time of the day. At least I do! Whenever I go out to a new restaurant for Brunch, I try to always order a Blood Mary. I want to see just how good each place can craft their drink. Now of course the number one thing I look for in a Bloody Mary is the taste, but I also like to see how each restaurant or bar garnishes their Bloody Marys. For me, the more garnish they can cram on top of my Bloody Mary, the better! So, even though I already had a Bloody Mary today for Brunch, I wanted to take a stab at making my own Bloody Mary at home. I went with a Classic Bloody Mary recipe. I found the recipe at Liquor.comhttp://liquor.com/, but I changed one of the ingredients and added a little bit more of their suggested amounts. This is a very easy drink to make. The fun part is trying to decide what garnish to use on your drink. First, you want to sprinkle some of the Celery Salt onto a plate. Next, rub a lemon or lime wedge along the rim of the glass to get it wet. Then roll the outer edge of the glass in the Celery Salt to get it well coated. Set the glass aside. Second, take a cocktail shaker and squeeze one lemon and one lime wedge into the shaker, and then drop both wedges into the shaker. Add the remaining ingredients and fill with ice. Gently shake the ingredients. Fill your pint glass with ice and strain your drink from the shaker into the glass. 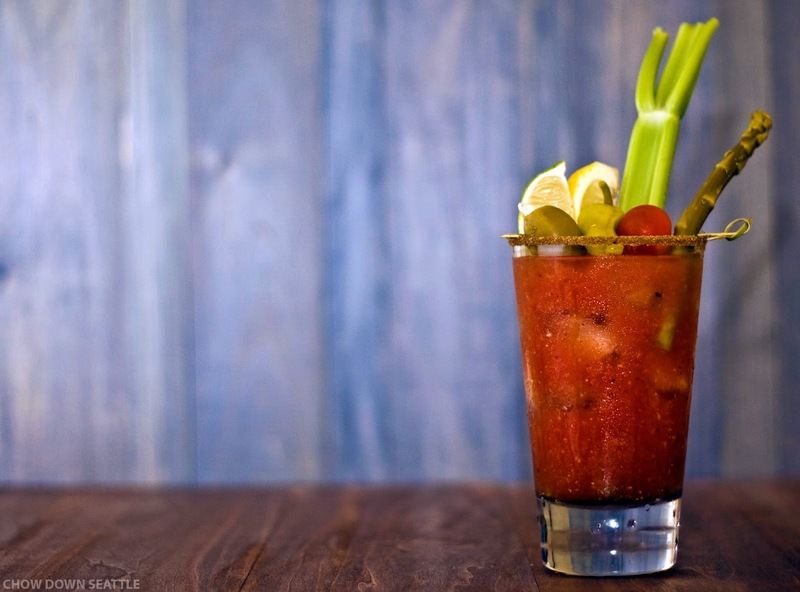 Lastly, garnish your Bloody Mary with your garnish of choice and enjoy! For my garnish I used a celery stalk, a cherry tomato, Mezzetta Garlic Stuffed Olive, Mezzetta Imported Golden Greek Peperoncini, Old South Pickled Asparagus, and a wedge of lemon and lime. If you create your own Bloody Mary, take a picture of it and post it to my Facebook page. I would love to see your creations! Cheers!